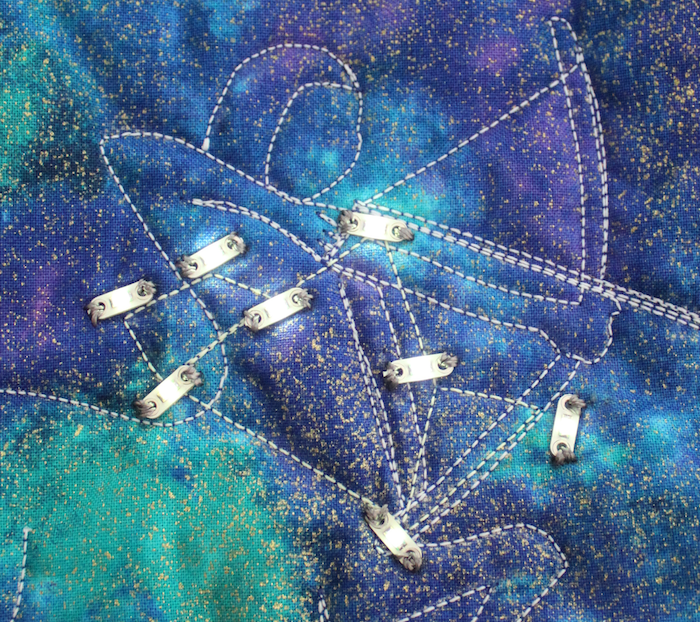 I made a small constellation quilt to test out some technology that I learned about at work. 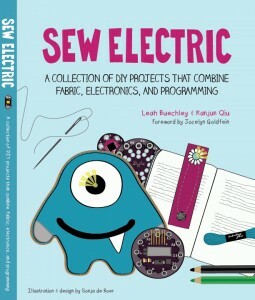 One of my co-workers purchased the book Sew Electric: A Collection of DIY Projects That Combine Fabric, Electronics, and Programming by Leah Buechley, Kanjun Qiu and illustrated by Sonja de Boer. There are four projects in this book that combine craft making, electronics, and computer science. I was intrigued and excited about using some of these materials in a quilted project. My idea included over 70 LED lights! So, before I ventured into such an ambitious project, I made a small sample to test out my technical skills. 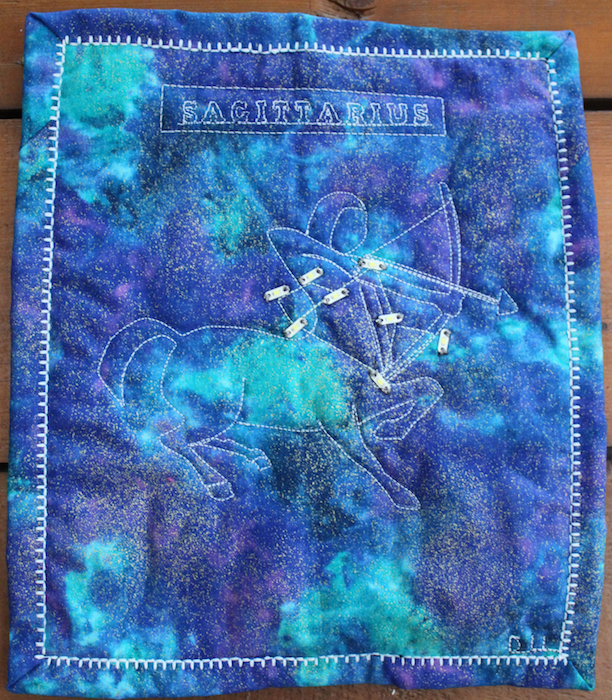 For my sample quilt, I chose one of the signs of the zodiac – Sagittarius a constellation with eight stars. I traced the design onto the top with dressmakers tracing paper, sandwiched the piece and machine quilted the design. I used the alphabet embroidery function on my sewing machine to stitch the title, and bound it. 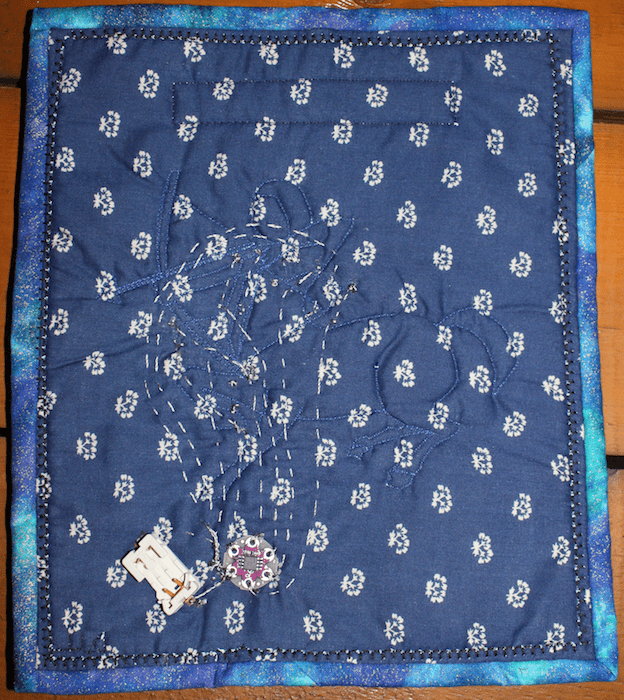 The quilt is about 8″ x 10″ and I quilted it with NiteLite Glow-In-The-Dark thread by Superior Threads. The thread really glows beautifully! 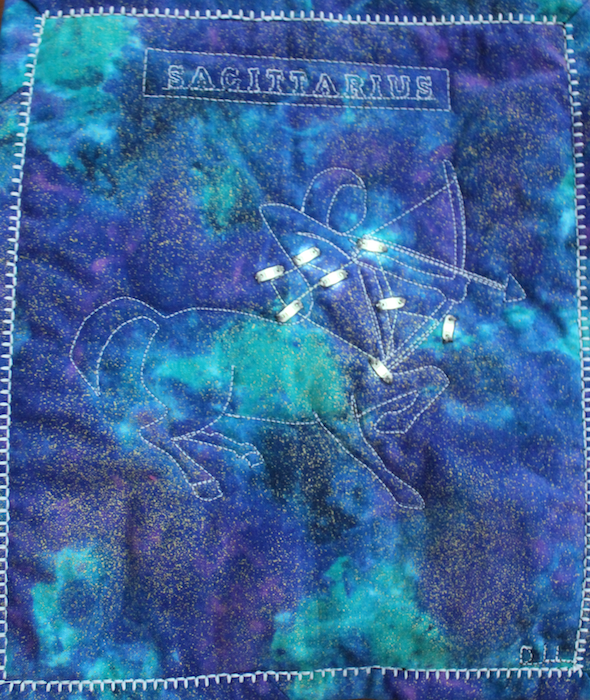 Once the entire quilt was quilted and bound, I sewed the LED lights onto the intersections where the stars are located in the constellation. You can see the conductive thread that creates a circuit, connecting the battery holder to the lights and to the Lilytiny. The Lilypad was created by Leah Buechly, an engineer, professor and designer. 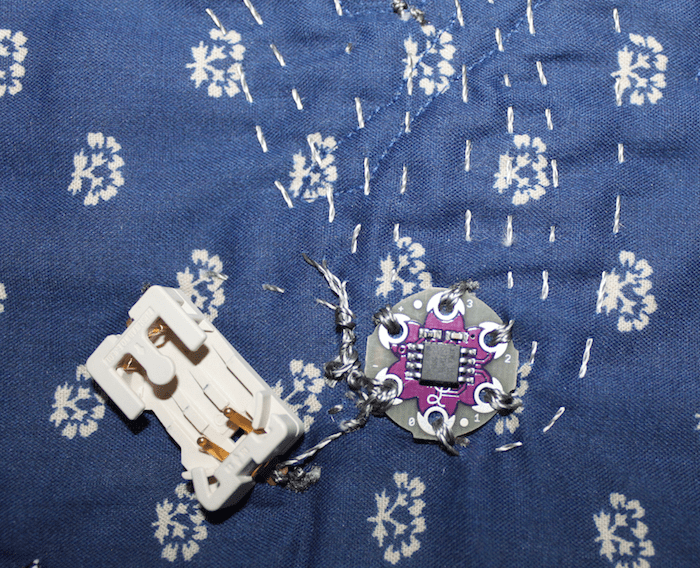 Lilypad Arduinos are small microcontrollers that can be stitched into clothing and programmed. 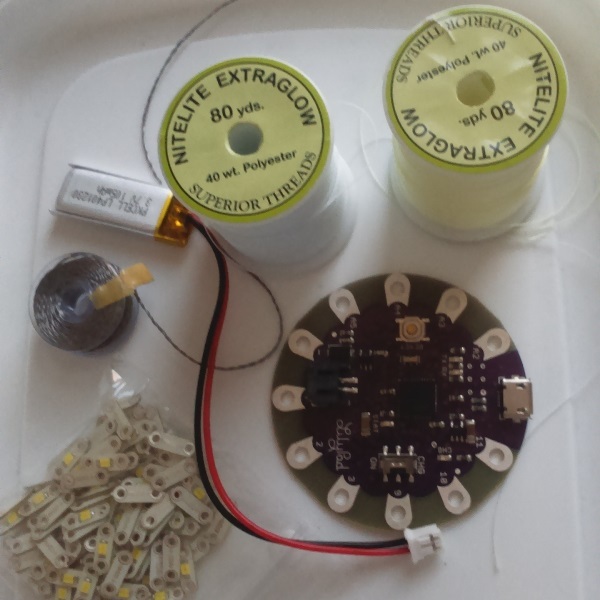 In this case, the LilyTiny is preprogrammed with four different controls: tab 1 LEDs flash like a heartbeat; tab 2 LEDs blink steadily; tab 3 LEDs twinkle; tab 0 LEDs fade in and out. I was really happy that I could make the technology work. The instructions in Sew Electric were excellent, clearly illustrated and explained. Information on how to sew with conductive thread, how to create circuits and how to troubleshoot problems are clearly given. I am confident in my techie skills now and am excited to start work on the much larger piece. Have you incorporated technology into your work? I’m inspired. Hubby bought me a lily pad awhile ago but I haven’t used it yet. I love your project idea. Thank you. Just jump in and try using the Lilypad. It’s so much fun to see the LED lights twinkle when you’ve made the right connections. I have a couple of more pieces in the works! Amazing work and beautiful – it would be wonderful to exhibit works like these together in the dark. What kind of battery are you using – is it rechargeable? Looking forward to your next project. Thank you Lies, it would be fun to display these in the dark! I have ideas for a couple more small pieces that light up – postcards that I am working on. The battery is a 3 volt coin cell. It’s not rechargeable, but will last a while, since I remove the battery when not in use. I will make certain that the next battery holder in the next project has an on/off switch though!